YANGON—Villagers residing on the site of the initial phase of the Dawei Special Economic Zone (SEZ) in Tanintharyi Division cautiously welcomed a recent agreement by Thailand and Myanmar to resume the project’s initial phase and upgrade a highway leading to the location, saying their homes are almost entirely lacking in basic services. Early this month, the National League for Democracy (NLD)-led government signed off on an US$8-million agreement to jointly upgrade a highway linking the Thai-Myanmar border with the SEZ and a deep seaport. The report was officially launched in Yangon on Thursday afternoon at a press event attended by four residents of villages in the affected area. The report focuses on the following six villages in Nabule region (which is in the heart of the SEZ project): Paradut, Hteingyi, Mudu, Wetchaung, Kamaungchaung and Ngapidat. The Irrawaddy asked the four villagers what they thought when they heard that the SEZ project would be restarted. They said they supported the plan but demanded that the government ensure equal access to information, a proper land-compensation scheme, transparency over the locations to be developed, job opportunities and a chance to improve their livelihoods. Daw Po Win from Nabule said villages situated inside the SEZ are still without access to the national power grid or government-operated gas turbines. Road conditions remain extremely undeveloped, while four townships in Dawei district have a 24-hour supply of electricity. Most of the villagers rely on electricity from private generators at a per-unit cost of about 900 kyats. “We are very glad about the SEZ resumption, but we hope things will be better than last time,” Daw Po Win said. The initial phase, an industrial estate, is expected to cost US$1.8 billion and cover 27 sq. km. That is a fraction of the cost and far smaller than the initial proposal. Based on a recent suggestion by the Dawei SEZ Management Committee, ERI believes all the phases of project could be constructed simultaneously. The government has consistently touted the potential benefits of the SEZ, but ERI says only vague information about the project has been released. 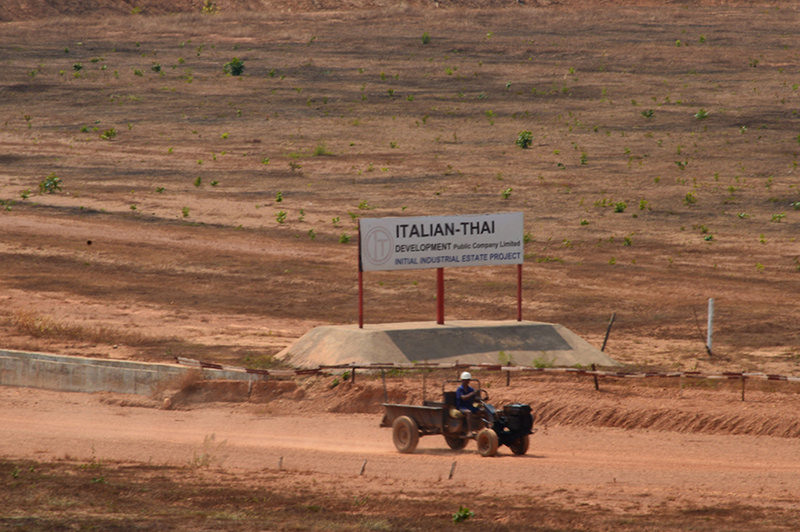 Moreover, locals have not received a single kyat in compensation for land damaged earlier by Italian-Thai Development Company (ITD). ERI adviser Ko Bo Bo Aung said ITD had discriminated in favor of powerful people when paying compensation, with ordinary farmers receiving very little. It’s unclear whether the company paid the full purchase price for locals’ land or just offered the usual rate of compensation. Government resettlement plans almost always divide the affected communities. The SEZ project was the brainchild of the administration of former President U Thein Sein. The master plan includes a deep seaport, a vast petrochemical estate, a smaller industrial zone for lighter and more labor-intensive industry, a coal-fired power plant, a reservoir, a new town to house workers, dual oil and gas pipelines, and road and rail links to Thailand. When local opposition to the coal-fired power plant erupted in 2012, the government decided to shelve the project for several years. It remains unclear whether the current government plans to proceed with the coal-fired project. The Union Parliament gave the Ministry of Construction a green light to take out a low-interest loan from Thailand’s Neighboring Countries Economic Development Cooperation Agency (NEDA) worth 4.5 billion Thai baht (approximately US$137 million, or 220.5 billion kyats). The ministry has been working with Thailand’s Department of Highways since 2015 on conducting measurements for the highway.